The XBRL Taxonomy Builder tool is a fully functional tool and powerful tool to develop XBRL taxonomies from Excel files. The first part is the taxonomy content. This is composed by the data dictionary, the relationships between the elements in the data dictionary and the resources like references and labels. All that information is stored in Excel sheets in a comprehensive format that allows non IT users to introduce, change and review it without deep knowledge about XBRL. For example, the definition of XBRL dimensions using excel templates is according to the business model designed by the Bank of Italy for the COREP taxonomies (Matrix Schema). That model is also used inside BdI for the definition of multidimensional databases. The second part is a language for creating the DTS (Discoverable Taxonomy Set). The language is used to specify the modular structure of the files that will constitute the DTS. The language contains references to the content (data dictionary, labels, references, presentation links, calculation links and dimensions…). The language can be used to specify different modular approaches for the same content in the Excel sheet. 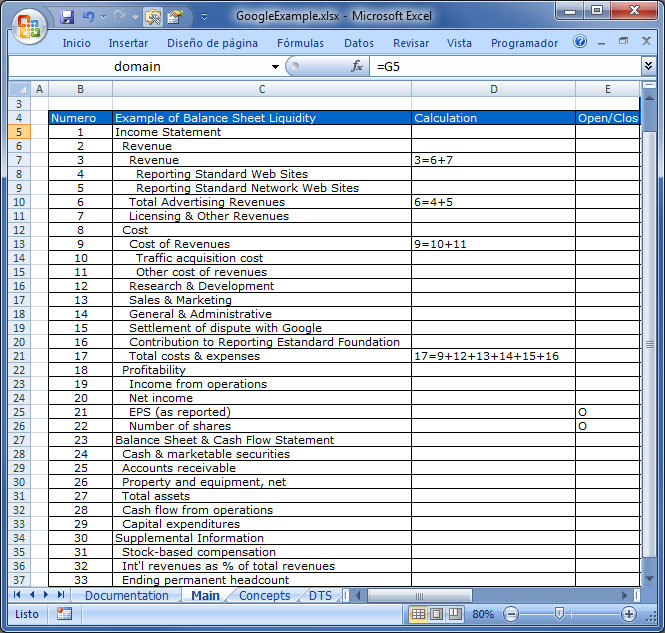 Compilador de Excel a XBRL The Excel Taxonomy Builder accelerates the process of creating an XBRL taxonomy because it eliminates the barriers for new comers. You’ll learn XBRL just by using Excel. Taxonomy development has never been something so simple. At the same time. 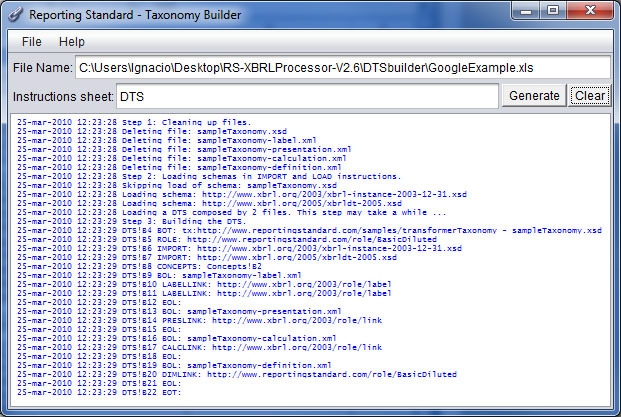 Taxonomy Builder allows the creation of high quality taxonomies because the revision of the taxonomy content can be executed by non XBRL experts that normally don’t know XBRL at all. This taxonomy builder has been used by the Superintendencia de Valores y Seguros de Chile in order to create an extension of the IFRS 2006 taxonomy in order to make it corresponds to the IAS published in the 2007 Bound Volume. It is a true fact that none of the high quality and high visibility XBRL taxonomy development projects are based on just one single XBRL Taxonomy editor. It is also true that none of those projects could be created without the right balance between what business people can do for the project and what IT people can do for the project. In fact, every XBRL project is a combination of a team work. The XBRL expertise is too technical (and not needed) for business users. Business users are keen to work with Excel. Excel allows for all kind of documentation (coloring, comments, additional sheets). All business experts are able to understand an Excel spreadsheet and provide useful comments without any notion of what XBRL is about. Inside the project team, Communication between IT experts and Business experts in key for the project quality. A tool that maximizes communication must be a tool that business experts and IT experts can understand. Excel allows for better Taxonomy modularization approach or even test multiple serialization strategies. Excel allows for using formulas (Excel formulas) to achieve higher levels of consistency in the taxonomy content Search capabilities on Excel are (by far) more powerful than search capabilities on any other taxonomy development tool Excel is a true team work tool. Multiple people can work on the same Excel workbook simultaneously. By contrary, Taxonomy development tools using a GUI are fine for doing simple prototypes very fast. Reporting Estándar S.L. clients uses both, XBRLizer for taxonomy viewing and Excel to XBRL Taxonomy builder for the taxonomy development. Business users fill-in the data on the visible part of the sheets. This will automatically modify the instructions for generating the taxonomy extension so Reporting Estándar Taxonomy Builder can read the excel and generate the taxonomy. It is live, in production, generating taxonomy extensions of IFRS 2010 extended by the Chilean SVS.